Developed from the Neo Zeon's AMX-014 Doven Wolf, the Silver Bullet is a specially designed Mobile Suit used by Vist Foundation after they reverse engineer the mobile suit during the Second Neo Zeon War. Like it's predecessor, the Silver Bullet has improved boosters for stability in Space and has better performance in combat. 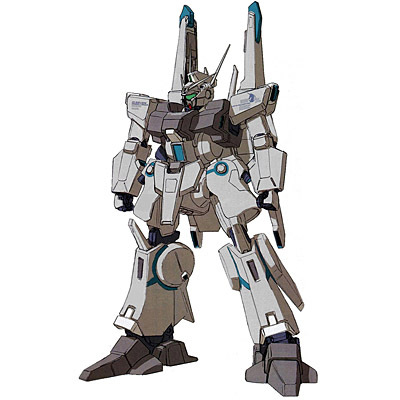 Unlike it's predecessor and the Doven Wolf's predecessor, the ORX-013 Gundam Mk-V, the unit is also equiped with the standard weaponry such as beam sabers and rifles, but also armed with a new shield, which converts into a hyper mega launcher. The Silver Bullet is also capable of using Incoms, remote wire guided weapons that are controlled by a computer control system. It's not fully confirmed about the Silver Bullet is considered a successor of the MK V.
It also features a Quasi-psycommu system, which was developed to extend the capabilities of remote control to non-Newtypes. This system can actively scan the pilot's brainwaves, no matter how weak they are, and then let the computer translate the thoughts into commands to be issued to remote weapons. Using the quasi-psycommu even non-Newtypes can control simple wire-guided remote weapons, such as INCOMs. INCOMs, unlike funnels or bits, still have to be tethered to their control unit by wires because the electrical signals to the INCOM would otherwise be disrupted by Minovsky Particles.